Hello, it's Sue here with today's Saturday Step by Step, and today I'm sharing a birthday card that I've made for a significant birthday for my other half! 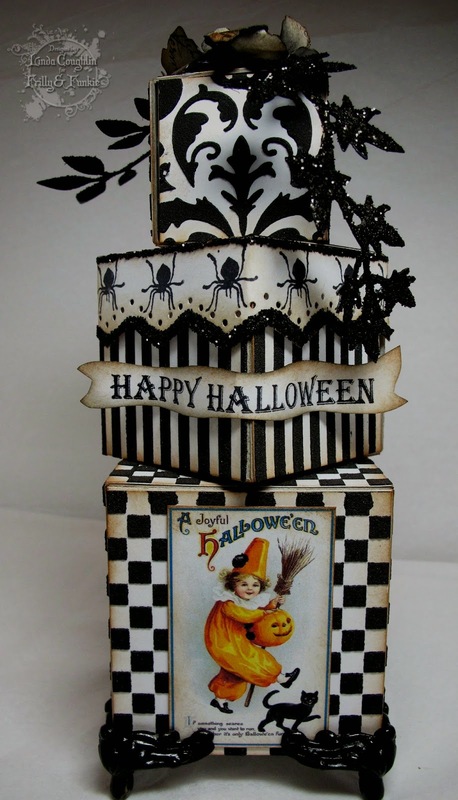 I started by using Wendy Vecchi's Translucent Embossing Paste through her brick stencil. When the paste was dry I started to layer up colour using watered down arcylic paint. With each layer of paint I used a slightly darker colour. For the darkest colour I didn't use it all over the card just around the edges. I then used the Prima Checked stencil and stencilled around the edge. 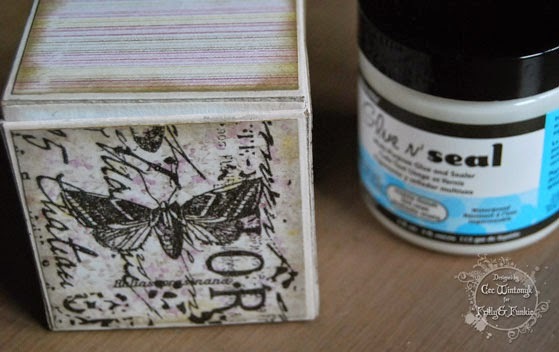 I then stamped with the script stamp from the Artistic Outpost French Flight using Potting Soil Archival ink. The balloon is from the Artistic Outpost Paris Exposition set and I stamped the first with Potting Soil Archival ink then masked it off and stamped it again. 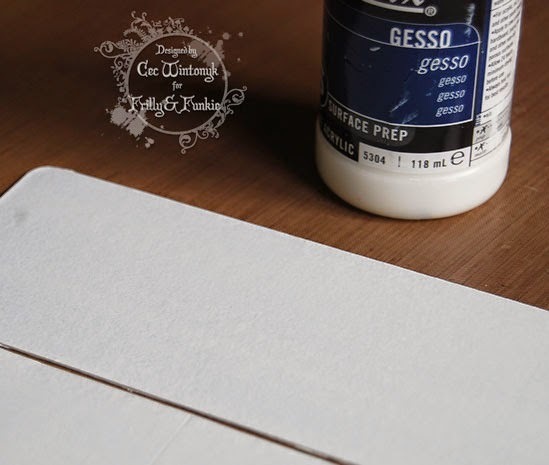 I then painted another piece of white card and used the numbers stamp from the Tim Holtz Mercantile set using Tree Branch Archival ink. I then used the On the Edge dies to cut the numbers panel and a second piece that I've blended Distress Ink over. To give the edges a burnt look I dabbed dark brown acrylic paint along them using cut 'n' dry foam. I then stamped 2 sets of diamonds from the Classics 3 onto some painted card then cut them out. 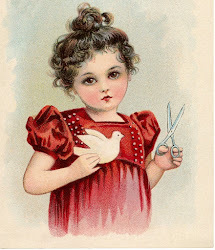 The bird and sentiment are from the Classics 16 set, the bird has been stamped onto card that I've swiped Distress Stains over and the the sentiment onto painted card. I've then cut both out. I then layered all my different elements up, you'll also see that I stamped the square stamp from the Classics 19 set as the top layer. I added some Idea-ology and also some numbers by Prima (which sort of give the game away!) The pen nib has been coloured with alcohol ink to darken it slightly as has the arrow. Hope you've enjoyed todays step x step! Welcome to today's Guest Designer Pamellia! Hello Everyone! I'm Pamellia and I live in Toronto, Ontario, Canada with my wonderful husband and our two little girls, Scully (a teacup Maltese) and Pebbles (a teacup black Pomeranian). Creativity runs in my family, so it's no surprise that I enjoy crafting. I have been dabbling in all sorts of crafts for most of my life, but I only recently discovered my true passion, card making. 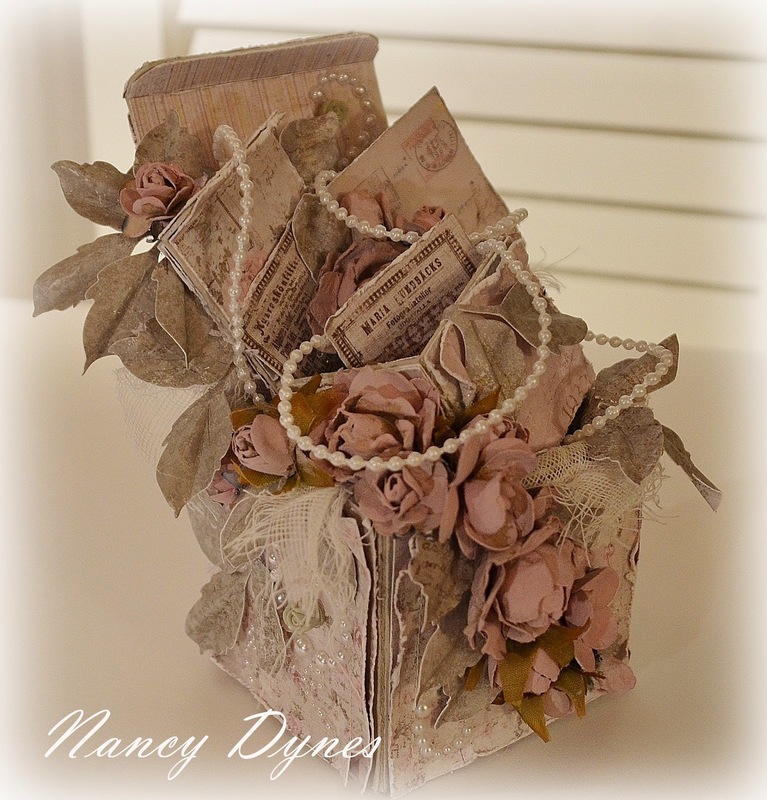 I enjoy cards and paper projects of all styles, but I think my favourite is shabby chic! 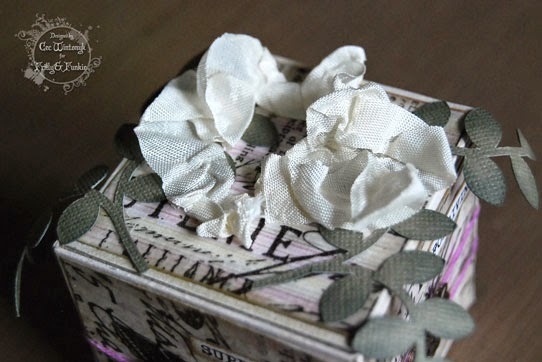 I love the soft muted colours, the big shabby bows and the girly laces. When the Frilly and Funkie team asked me to be a Guest Designer, I was just so honoured. When they gave me SUMMER GARDEN as the theme, I knew I had to do something extra special with some frill and some funk. So in honour of both the Frilly and the Funkie teams, here is my Summer Garden Flower Box. Whenever possible, I try and make every aspect of my projects by hand. 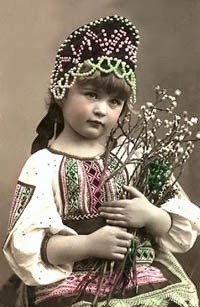 I prefer to make my own backgrounds and flowers, I dye my own ribbons, I even make some of my embellishments out of clay. I find such a sense of accomplishment in knowing that I made it myself. My flowers here were made with a poinsettia die and coloured with Tim Holtz Spun Sugar and Squeezed Lemonade. The butterfly is made out of clay. I painted it bronze, covered it with Crackle Accents and then rubbed some Black Soot distress stain into the cracks. 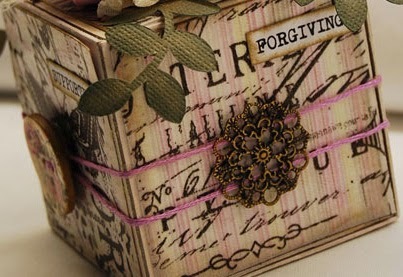 I am just starting to learn the ins and outs of Tim Holtz, thanks to the Frilly and Funkie team. They, among others have really inspired me to learn some new techniques and styles, which I am slowly trying incorporate into my work. 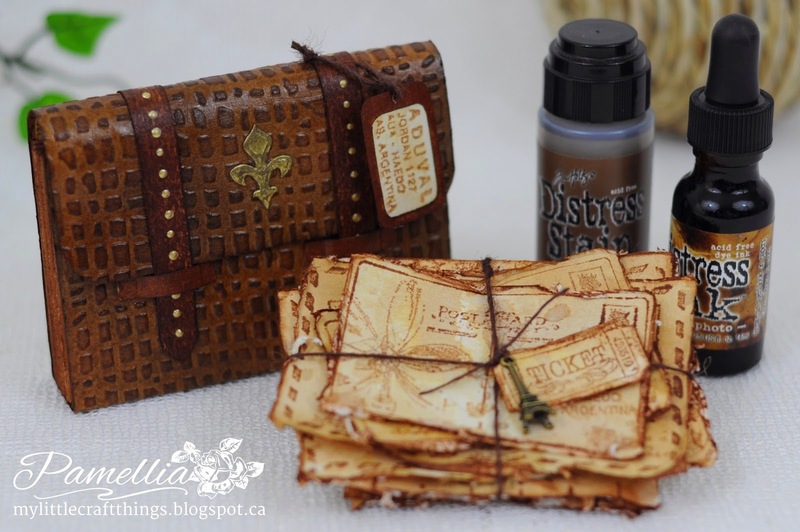 The base of my project was made out of a cereal box and inspired by the Tim Holtz style. Sure hope you enjoyed my project! Thank you so much to the Frilly and Funkie team for inviting me to spend a day with them. If you would like to see more photos and lots more details, please visit my blog at My Little Craft Things. I'm sure you'll all agree that Pamellia's project is beautiful and has provided lots more inspiration for the current challenge of 'A Summer Garden'. If you would like to be in with a chance to join us as Guest Designer too all you need to do is join in with the challenge! 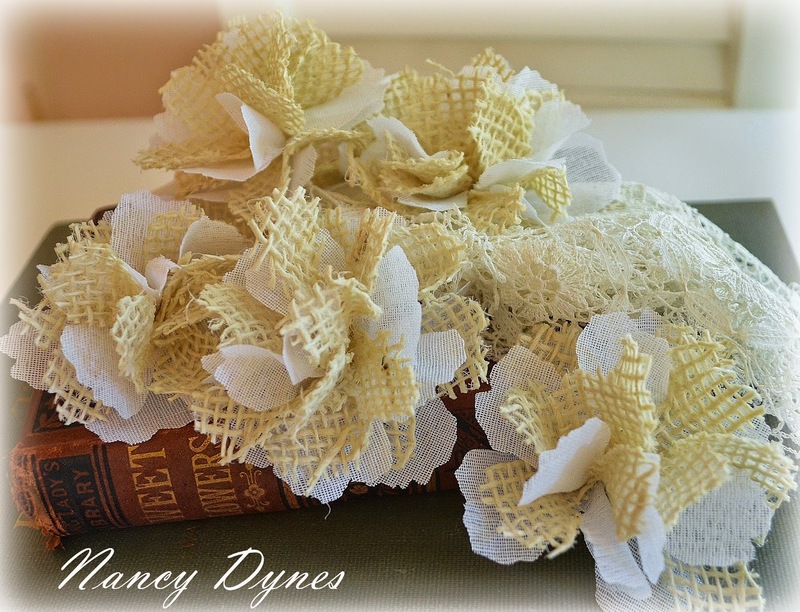 Friday Focus: Burlap Flower Tutorial! Editor's Note; before we hand over to Nancy for a fabulous tutorial and details of our Friday Focus products for this fortnight, we wanted to remind you that our 'Block Hop partners' this fortnight are The Artists on the Block. Their amazing Design Team has been joining in with the 'Hip to be Square' fun and have come up with even more inspiration of their own for using these versatile cube shapes. Make sure you hop on over to their blog HERE to see what they've created and let them know if you like what you see! Hello! Nancy here, and I'd like to welcome you to the Friday Focus at the Frilly and Funkie! Our focus this period is on burlap and jute, and for the next two weeks Linda is generously offering an additional 15% off this line of products at The Funkie Junkie Boutique! 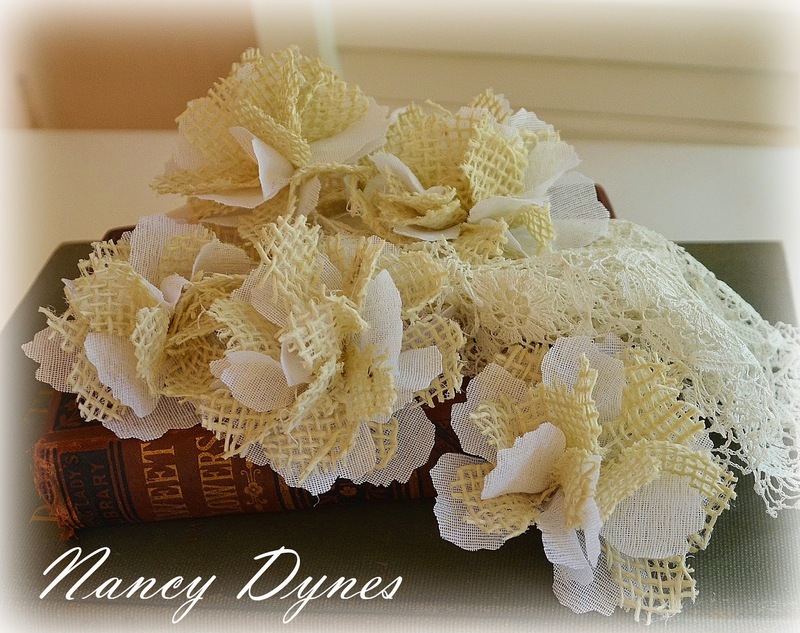 I have a simple technique to create these rustic yet elegant flowers using burlap and crinoline. Working with burlap can be challenging because it likes to shred and fall apart, but I've found a fool proof solution that makes these flowers sturdy and long lasting. 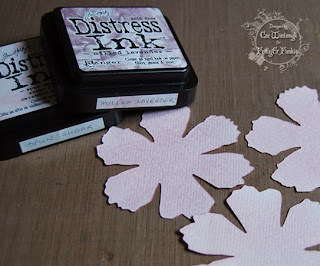 I begin by die cutting the petals using a Tim Holtz Tattered Florals die. 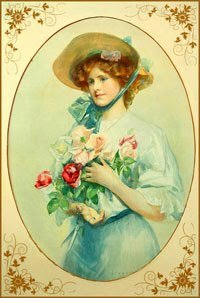 You need two burlap petals and two crinoline petals for each flower. It's amazing how easily the die cuts through the burlap and crinoline. I cut two layers of each at a time. The next step is to coat both sides of the burlap petals with Claudine Hellmuth Studio Matte Medium. (You can substitute Ranger Multi Medium Matte for this, available in a range of sizes at The Funkie Junkie Boutique). I do this using a foam brush. This is the step that will prevent your burlap petals from shredding apart on you. The petals will look very white when you first apply the medium, but it disappears as it dries. Layer your petals while the Matte Medium is still moist. I use crinoline as my bottom layer and end with the final layer of jute on top. Be sure to stagger your petals as you layer. Next I simply roll them up. Place each flower in an egg carton and let them sit until they are almost dry but still tacky and pliable. At this point I use a needle and thread, pinch the bottom of the flower and stitch a couple of times through all the petals in both directions. Trim away any stray threads from the back then turn your flower over and begin shaping it. I do this by pinching the bottom with my left hand while twisting and shaping the petals with my right hand. I repeat this process until I get a look I'm happy with. 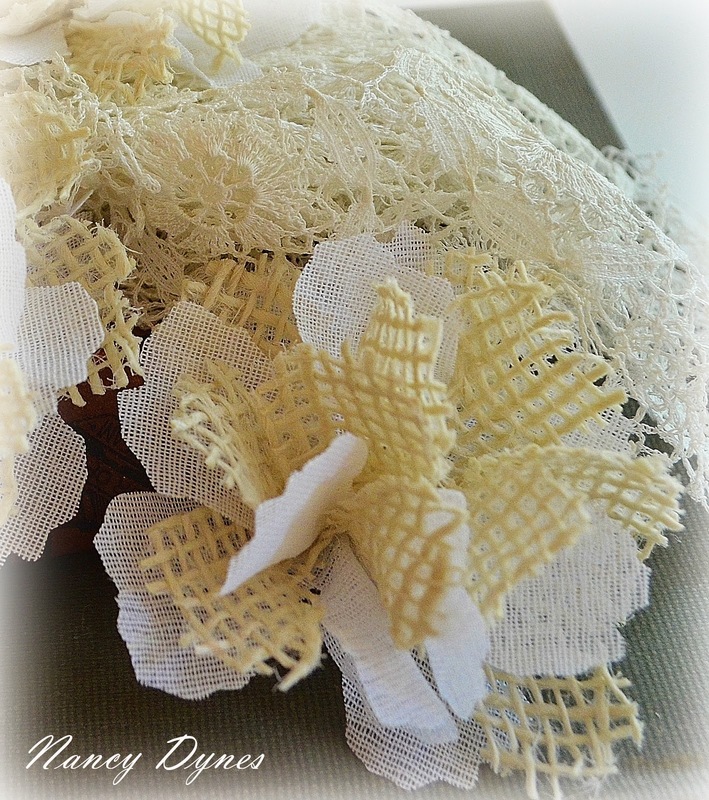 The Matte Medium keeps the burlap from shredding and helps you mold your petals to give them a bit of shape. The final step is to set the flowers aside to finish drying. 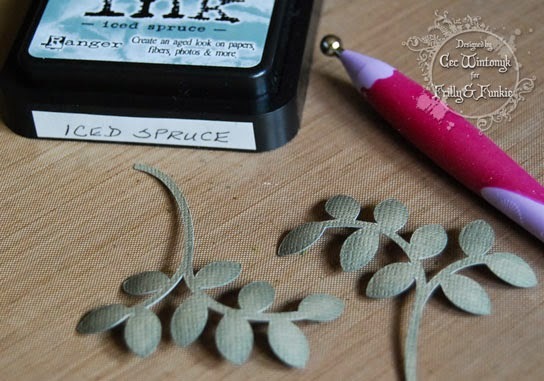 Once dry you can get creative with adding leaves or other embellishments. I chose to keep mine 'as is' for a beachy project I have in the works. These flowers are so fun and versatile! 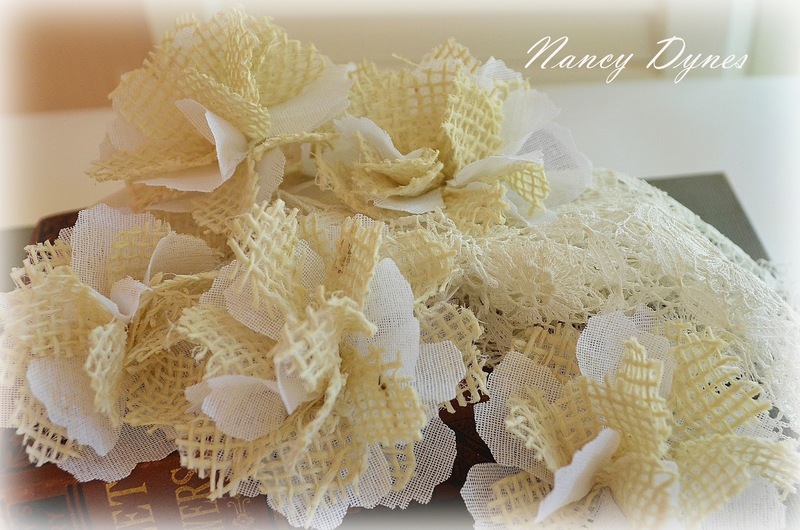 Add additional layers, use larger or smaller petal sizes, use only burlap, or alternate lace with the burlap, the possibilities are limited only by your imagination. I wish you a wonderful weekend! Thank you so much for stopping by, and don't forget to take advantage of the 15% discount on burlap and jute at the Funkie Junkie Boutique! Don't forget, you can use Ranger Multi Medium Matte for this technique. Hi everyone. 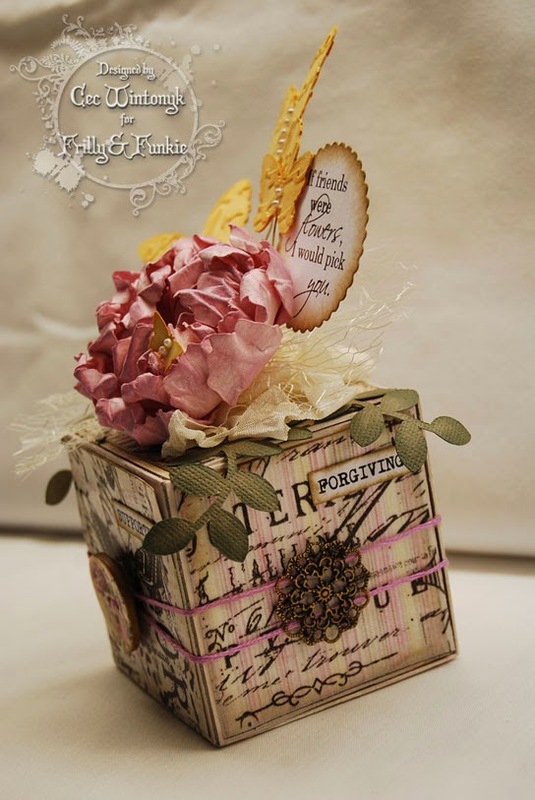 Jenny here as your host for this fortnight and we are back for our second week of the current challenge; we want you to create a 3D vintage or shabby chic project based on a cube shape. The Design Team have used Artist Trading Block cubes (available at The Funkie Junkie Boutique and discounted an extra 15% during this challenge period - that's a $39.99 die on sale for just $27.19!) 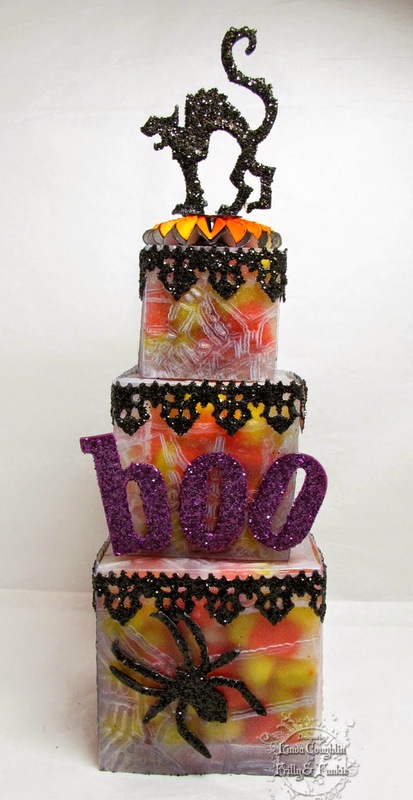 but let's be clear, you can use your own templates, dies or hand cut cubes if you would prefer. 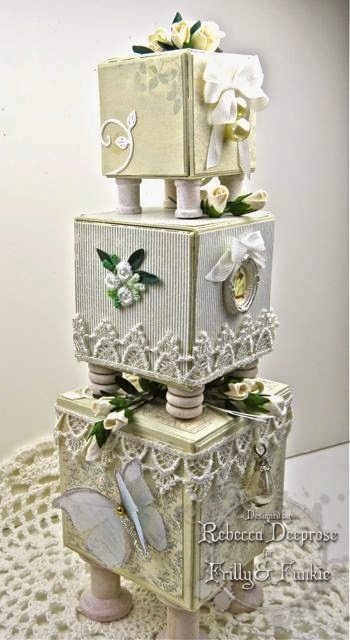 Decorate, embellish and alter them in any way you choose as long as they are cube shaped and have a vintage or shabby chic feel. Share your 3D cube projects with us to be in with a chance of winning a Guest DT spot here at Frilly and Funkie or a $25 spending spree at The Funkie Junkie Boutique! To enter you must create a new project, link it below and make sure you add a link in your post back to this challenge. You can combine our challenge with up to 10 challenges (including this one) to be in with a chance of winning. If you are entering through a public forum please sue the keyword F&F. Also, please be sure to turn off your Word Verification so our Design Team can leave you comments. As an added bonus this fortnight we are teaming up with our friends at 'The Artists on the Block'. 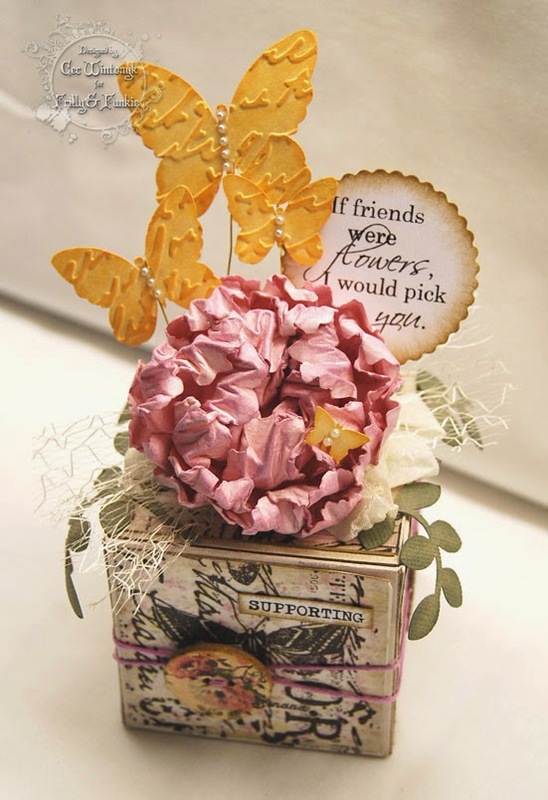 They have a dedicated Design Team using Eileen Hull Designs cubes (and many other 3D die cut shapes) in incredibly imaginative ways so make sure you take a look for some added inspiration. And with their companion challenge blog 'Art With Heart' having an 'Anything Goes' theme this month you've got the option to enter your creations there as well to be in with a chance to win a brand new Eileen Hull Designs die! Having seen these it's now your turn to share your 3D cube shaped vintage or shabby chic projects using the link below. The Funkie side of the Design Team will be back next week to show you their take on this theme so make sure you remember to check back for that added inspiration. 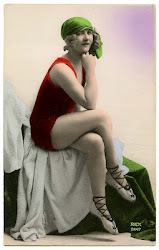 As promised we are back to announce the winners of the 'Vintage Travel' challenge. Before doing that we would like to say thank you all of those who took the time to enter with some amazing projects, but of course there can only be one challenge winner and this time the Design Team voted for #3 Pamellia. We all absolutely fell in love with this carefully crafted little vintage travel bag and all of its hand stamped/altered contents. Congratulations Pamellia on being our Funkie Favourite for the 'Vintage Travel' challenge and winning the opportunity to be a Guest Designer here at Frilly and Funkie for a future challenge. And Random.org has chosen a winner for our $25 gift certificate to The Funkie Junkie Boutique. Our congratulations go to #9 Darlene Pavlick. A huge vote of thanks from the Frilly and Funkie team to everyone who took part in this challenge and congratulations again to our winners. Please email Linda at thefunkiejunkie@gmail.com for the codes for the winner's badge and to give us your email address for the Guest Designer details (Pamellia) and for the gift certificate details (Darlene). Our current challenge, 'Hip to be Square' runs through Tuesday, August 26th. We hope to see you entering this time around so that you too can be in with a chance to win. And remember, you can enter up to 10 challenges including ours, and a maximum of 3 entries per person to our challenge. Please remember to link back to our challenge in your entry and mention in your post that you are entering this Frilly and Funkie challenge. Editor's Note; Thank you so much to Cec for providing us with a step by step for her incredible DT project - we're all really excited to find out how she put this beautiful Artist Trading Block together! Before handing over to Cec we wanted to remind you that our 'Block Hop partners' this fortnight are The Artists on the Block. Their Design Team will be coming up with inspiration of their own for using these versatile cube shapes, and Oxana's clever idea is available HERE. We'll keep you informed of further projects from this talented team during our regular posts. Hello, it's Cec here and it is my turn to present the Saturday Step X Step. 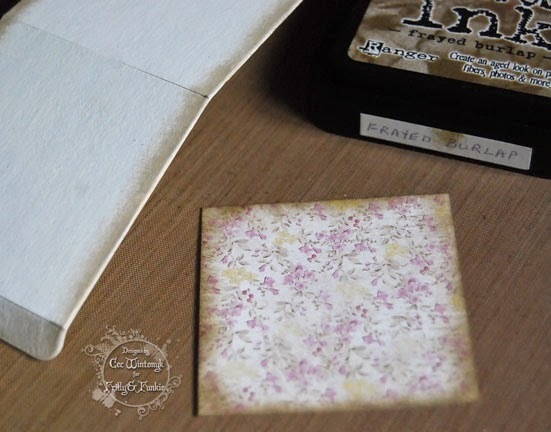 Today I am going to show you how I made this Artist Trading Block for the current challenge 'Hip to be Square'. I actually started by making the big peony first - at least I think it looks like a peony. First I cut six of the large flowers from watercolour paper using the Tim Holtz Tattered Florals die. Then I inked both sides of each flower with Milled Lavender and Spun Sugar Distress Ink. 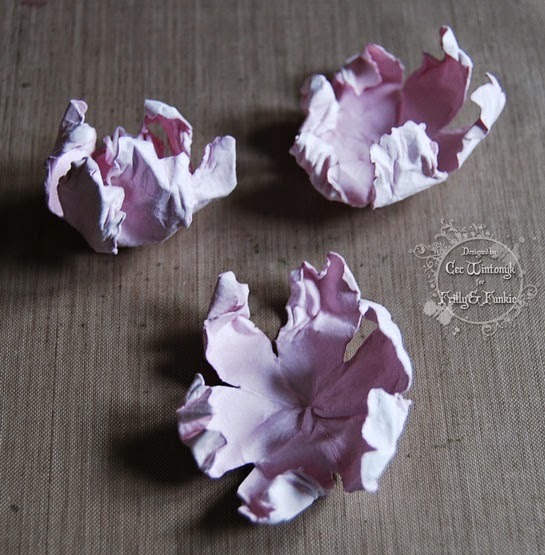 After they were inked, I misted them on both sides with water and then using a piece of dowel, I shaped each petal by first rolling them around the dowel and then while they were still on the dowel I squeezed the sides of the petals together to ruffle them. Next I folded each flower in half between petals, then in thirds and twisted the bottom, which is the centre of the flower. Once they were dry, I carefully unfolded them and scrunched them from underneath to form a cup shape as shown above. I added more Milled Lavender DI to highlight the ruffles. Once all the flowers were shaped and inked again, I started stacking them making sure that I scrunched the inside flowers so that the final product had a closed centre as a peony would. Finally I spritzed it with some Perfect Pearl spray to give it a bit of shimmer. 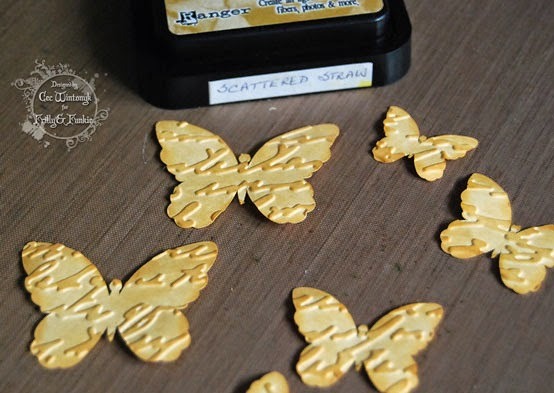 The next step was to create some butterflies. I cut three pairs in different sizes with my Cameo from some scrap card stock, embossed them with a script embossing folder and then inked the highlights with some Scattered Straw DI. The pairs were then glued together back to back with a fine piece of wire in between and I put some pearls on the front for the body. Note: In the end the wire I used was not stiff enough because after I took photos of the finished box, the two larger butterflies started to droop so I am going to find another type of wire so they will still look like they are flying - off to raid my husband's workshop because I think he has some stiff copper wire. Next I cut some leaves from some Color Core Card Stock using my Cameo. Then I shaped the leaves a bit by taking a large embossing tool to the back of each leaf. After they were shaped I inked the edges with some Ice Spruce DI. The sentiment was easy to make. I just printed a sentiment from Create with TLC on the computer, cut it out with a Spellbinders die and then inked the edges with some Frayed Burlap DI. Now that all the embellishments were made, it was time to start assembling the block and the first thing I did was to cover both sides of two dies with a coat of Gesso. 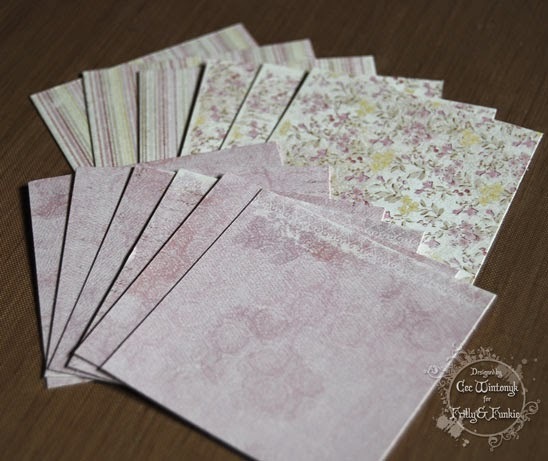 Next I cut 12 pieces of patterned paper from the Coffee in the Arbor paper pack from Maja Designs. Then I inked each edge and fold area on both sides with Frayed Burlap DI. Don't forget to ink where the folds are - my photo was taken and then I realized I hadn't done that. The next step was to add the paper to the block and assemble it. I started by gluing the paper to the sides that would be outside and the sides on the inside that would not have any attaching pieces. Next I glued it all together and then added the paper to cover the final inside panel where it was fastened together. I used a popsicle stick to make sure everything was glued down. 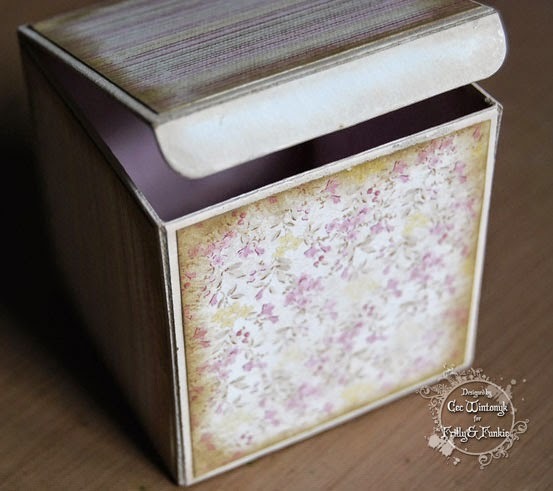 Next I added a panel of Tim Holtz Melange Tissue Wrap over the patterned paper on the top and each outside panel of the block. The next step was to decorate the sides (I forgot to take a photo at that point but did find it easier to decorate the sides before the top). I ran embroidery floss around the block twice, crossing it in the front and keeping it parallel on the sides. Then I added a big Prima button at the crossing point in the front and some filigree medallions on each side. I created four words on the computer that reminded me of a friend, cut them into strips, inked them with Frayed Burlap DI and added one to each side in various spots. Then I started to decorate the top. First I added the leaves to each corner and then I lightly crinkled some seam binding and added it in a circle around the top looping it as I went. The reason for the loops is that it would add some height to rest the flower against and provide a way to hide the mechanism that holds the butterflies. I added some mesh and then the big flower. I punched a tiny butterfly to rest on the flower. 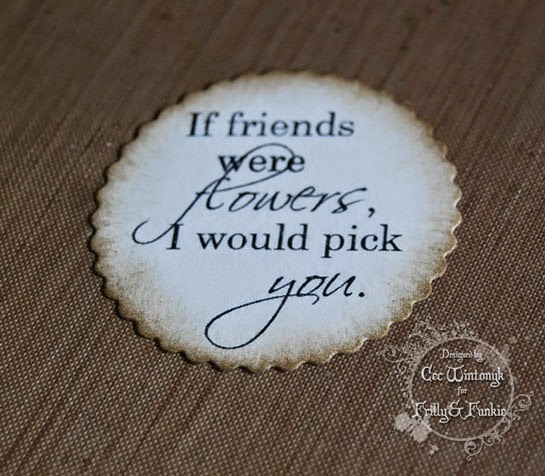 The sentiment is glued to the back of the flower. I cut a tiny rectangle of hard styrofoam (the kind you get as packaging when you buy a piece of electronic equipment), inked it with some Scattered Straw DI and then nestled it inside one of the seam binding loops and then stuck the "flying" butterflies in it. 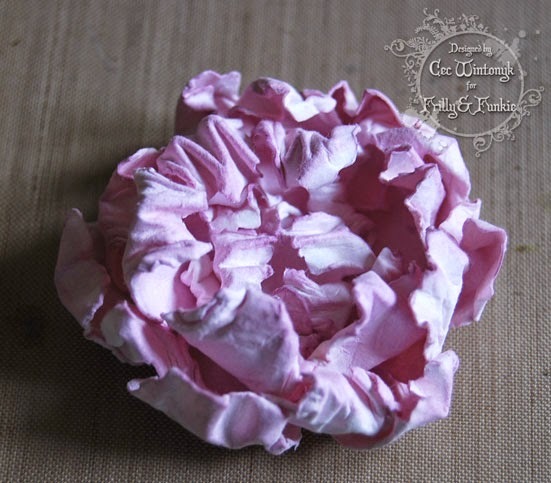 And there you have my frilly little peony block, which is just 2 1/2" on each side. The products listed below used in the creation of this little block came from The Funkie Junkie Boutique and if you want to make an Artist Trading Block yourself and enter our 'Hip to be Square' challenge, the die set is further discounted by 15% for the remainder of the challenge. Welcome to today's Guest Designer, Kerstin! Friday Focus - Art Parts!